Rice krispie treats are one of our favorite quick & easy recipes. They are so easy to throw together (only 3 ingredients!) and they're endlessly versatile. Plus, now that my daughter wants to help out more in the kitchen, I can have her whip up this easy no bake recipe for kids without supervision because it's just so simple. As my daughter gets older she wants to help out in the kitchen more often. I love having her help out and easy no bake recipes are the perfect thing for kids who want to start cooking. And rice krispie treats are so simple to make - there's barely any supervision involved. And because this is such an easy recipe - there are so many varieties and ways to change up the usual treats. Dip them in chocolate, switch out the cereal for another kind, add some peanut butter - there are really endless ways to dress up this easy recipe! 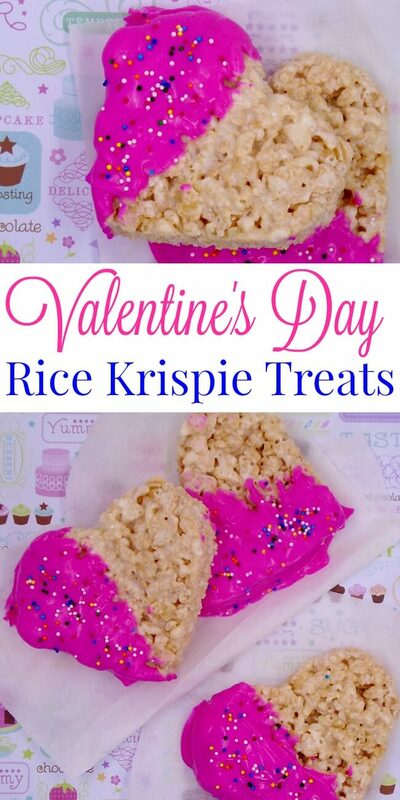 Now that Valentine's Day is just around the corner we decided to make a special treat for some friends and family - Valentine's Day Rice Krispie Treats. Start by melting the butter in a medium-sized pot over low heat. Add the marshmallows and stir until melted. Remove from heat and pour in the cereal and stir until well combined – your arm will get quite a workout! Once the cereal is well mixed, pour it out on a large, parchment-lined cookie sheet. Using another sheet of parchment or well-buttered hands, press the mixture out to a flat, even thickness, about 3/4-inch thick. Let cool. Melt the chocolate in a double-boiler over medium-low heat or in the microwave, stirring well. Dip half of each heart-shaped Rice Krispie Treat and place back on the parchment-lined cookie sheet. Sprinkle the melted chocolate half with the decorative candies before the chocolate hardens. Repeat with the remaining Rice Krispie treats. Package them up as gifts for family and friends or keep them all for yourself! Find what you need on Amazon (these are affiliate links). Melt the butter in a medium-sized pot over low heat. When the butter is melted, add the marshmallows and stir to combine. 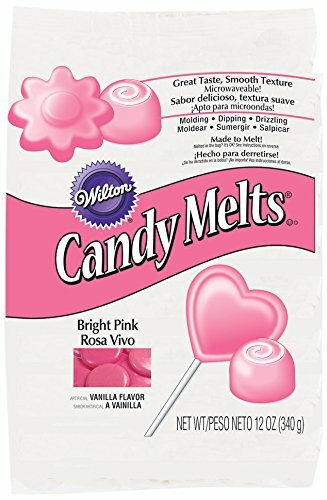 Continue stirring until marshmallows have completely melted. Remove the mixture from the heat. Add the cereal and stir well, until it's completely coated with the marshmallow mixture. Pour the mixture on a parchment lined cookie sheet. With well-buttered fingers, press the mixture out to about ¾-inch thickness. 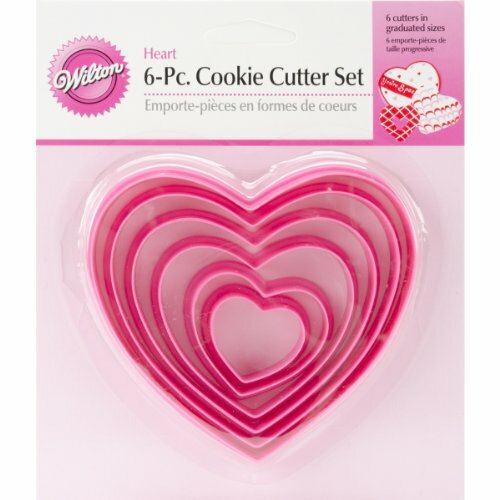 When firm, use cookie cutters to cut out hearts or other shapes. Melt chocolate in a double-boiler (or in the microwave) and dip the Rice Krispie Treats - either half the heart or the top of each treat. Decorate with sprinkles before chocolate hardens. Let sit at room temperature until completely cool and hard. 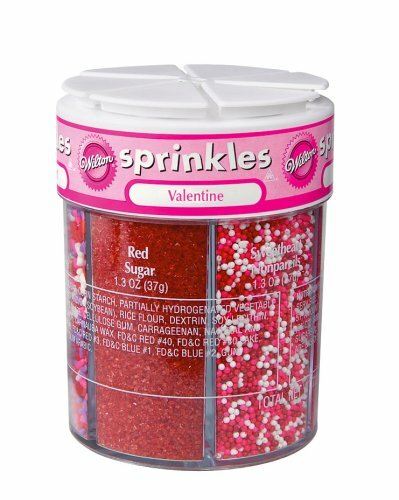 Store in a covered container or package individually for gifts.